Passengers have been left stranded at Glasgow Airport after the collapse of holiday firm XL led to the cancellation of their flight to Tenerife. The firm said overnight that high fuel costs had forced it into administration and all flights had been cancelled. 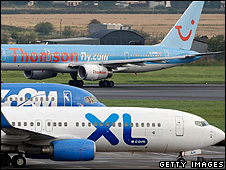 XL destinations from Glasgow included Corfu, Tenerife and Florida. A return flight from Tenerife at 1700 BST has also been grounded and flights to and from Dalaman in Turkey, which used XL planes, have been rescheduled. The Civil Aviation Authority said it was working with XL's administrators and other tour operators to return 85,000 Britons from abroad. Passengers arriving at Glasgow Airport in the early hours of Friday morning to check in for a 0700 BST XL flight to Tenerife were handed a leaflet saying the company had gone into administration. Morag Taylor, from Hertfordshire, travelled to Scotland overnight to pick up a fellow traveller to Tenerife. "I drove 400 miles to Stranraer last night, then to Perth to pick up my boyfriend's mother," she said. "We got to the airport at 3am only to be confronted with a letter to say our flight had been cancelled. That was the first we knew of it. "I actually spoke to Freedom Flights this morning to try to book an extra flight for a friend of ours and they didn't say one word about this problem." 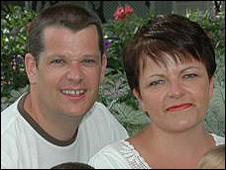 Jean Bryan, from Barrhead, was also due on the flight to Tenerife. She said: "I'm very upset. This has been booked since March - I work all year for this holiday." The collapse of XL has had a knock-on effect on passengers of other tour operators. A ScotTravel flight to Dalaman in Turkey, which was chartered from XL, was due to depart Glasgow Airport on Friday at 1825 BST. However, it has been rescheduled to 0145 BST on Saturday after the operator found a substitute plane from the Turkish airline Freebird. Another ScotTravel flight to Dalaman, originally due to depart at 2255 BST on Saturday, has been rescheduled to 0705 BST on Saturday. Flights from Dalaman which were due to arrive in Glasgow at 0440 BST on Saturday, and 0855 BST on Sunday, will now arrive at 0045 BST and 0605 BST on Saturday. 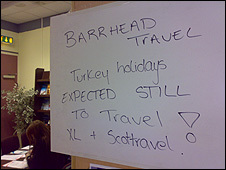 Angelina Aydon, from ScotTravel, said: "Everyone is coming home, some slightly earlier and some slightly later. "At the end of the day it's a case of needing to get them home and we will fulfil our duty and bring them home." A further 200,000 people also have advance bookings with XL. Alex Robertson, 35, from Glasgow, who works in Moray, was due to fly in October to Majorca with his wife and two children. He said: "I booked the flights, costing more than £1,000 on XL.com with a visa debit card. If I had got into debt and used a credit card I would've got a total refund. "Insurance does not cover the collapse of the company and my bank tells me they will ask the administrators for a refund, though my chances appear remote. "There has to be greater consumer protection in these circumstances. This is the third largest holiday firm in the UK, if they can go under then no-one is safe." Jim Hughes, from East Kilbride, suffered a double blow when trying to book a family holiday to Palma in Majorca for next month. He booked flights with Ryanair from Edinburgh Airport but was this week told they had been cancelled because of strike action at Boeing. "We then had another look to see what alternatives we could get and decided to book XL flights," he said. "Then I heard about their collapse on the way to work this morning. "It just shows you the state the industry's in - it seems like it's only the major players that can be relied on now, although XL was Britain's third largest tour operator group." Mr Hughes has been told it may take up to six weeks for his money to be refunded. "It could be a lot worse, it must be terrible for the people stranded in airports," he said. "I definitely won't be trying to book a holiday a third time, the prices have rocketed now anyway." XL owned an airline and several travel companies, including Travel City Direct and the Really Great Holiday company, and operated from three bases including one in Glasgow. The company blamed its demise on the high cost of fuel and the economic downturn. The CAA said anyone who was due to travel from the UK should not go to their departure airport. Most customers should get a refund, but people who booked through XL's website or call centre without using a credit card or a Visa debit card will not get their money back. Roddy McPhee, the chairman of the travel association, Abta Scotland, said he had not seen such events in the industry before. "I've been in the industry a very long time and clearly the price of fuel is having a major effect on all airlines and consequently onto tour operators," he said. "The airlines are having to review all of their business models at this stage, whether they are budget carriers or major scheduled airlines." Are you affected by the issues in this story? Do you have a holiday booked with XL? Send us your comments and experiences using the form below.